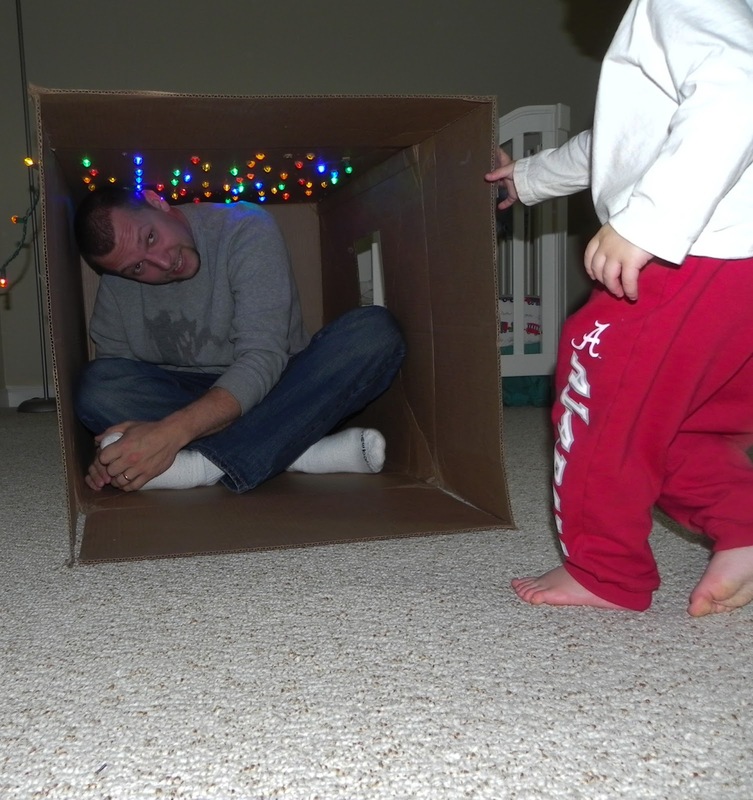 There are soooooo many things to do with an empty box, the options are almost endless. We happened to have a huge one and it went from a house, to a cave, to a cave of stars. Its a simple concept, really - but oh so fun!!! 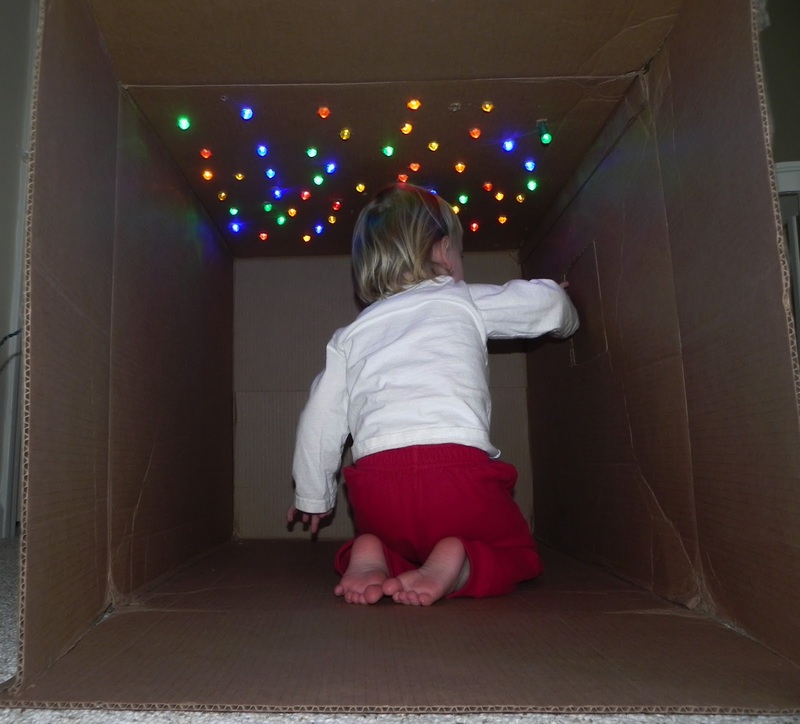 All you need is a box, a paint brush, a knife, and a strand of Christmas lights. I used the knife to initially cut out windows (per my son's request)....but somewhere along the path of bats and spiders and the dark, he decided it was a cave and it needed stars. I took a paint brush (the size of the ones you get with watercolors - you could also use a screwdriver), and poked holes in the top of the box. Then I pushed the Christmas lights through, and we had STARS!! We gazed up at the stars together, talking about their colors and about real stars - and even read books in our "cave of stars". It was a wonderful adventure!! This is brilliant. Makes me want to find a big box! This is awesome! I saw this pinned on pinterest and I will have to try it with my kiddos! I am now following your blog and I am excited to find more play ideas for my little ones!! Great rainy day/indoor play! Had fun putting it together with my older one and watching them both enjoy! Thanks for the ideas!! love love love this idea. Have reblogged it over at my speech pathology blog with some additional ideas for developing language while you play. thanks so much for sharing. We are expecting a big box in the mail soon...now I know just what to do with it! Thanks for posting such great ideas! I just made one of these. They are really neat. My kids haven't got home yet, so they are going to be really surprised. My only worry is the lights getting really hot. What did you use to make the stars? I used a small paint brush to poke the holes and stuck Christmas light through them. Love it I could do this for VBS this year! I'm so disappointed...I was REALLY inspired to do this after reading your post. I did it, and we only got to enjoy it for one afternoon before my directors made me take it apart. They said it was a fire hazard/ choking hazard. So...I'll be making it at home for my son! :) Still---awesome idea! The kids could NOT get enough of it for that one, joyous afternoon. Finally, got a box big enough to do this! My boys are loving it.